Fiorella Fumagalli handles registration strategies for trademarks, commercial names and advertisement signals. She is a key advisor in prosecution and management of trademark portfolios, patents and other IP rights. She takes care of clients in the pharmaceutical, technological, cosmetics, beverages and consumer products industries regarding office actions and oppositions. 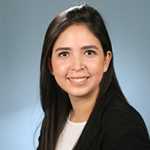 She also advises regarding reconsideration and appeal recourses before El Salvador Trademark and Patent Office. She is also responsible for drafting international contracts, trasfers, franchises and licences. Adriana also supports other attorneys regarding industrial designs, utility models and patents.